The exchange-traded fund (ETF) Robotics & Artificial Intelligence ETF (BOTZ) has done well so far this year by investing in companies that are involved in the development and production of robots or artificial intelligence aimed at benefiting humanity. Artificial intelligence (AI) is a specific field in robotics where the ultimate goal is to create a machine with the capability of undertaking a thought process similar to that of humans. This includes the ability to learn, to reason, to use language and to formulate original ideas. As fast-growing technological fields with high potential, robotics and AI have made vast advancements in recent years, especially in areas such as manufacturing. However, the speculative nature of the technology means that AI and robotics companies in the field inherently carry a fairly high degree of risk. BOTZ somewhat mitigates this problem by providing investors with exposure to a group of companies in the field, thus diversifying the risk to a certain extent. BOTZ invests only about a quarter of its $146.43 million total assets in U.S. equities. The rest is invested in companies in other developed countries such as Japan. Year to date, BOTZ has returned 25.37% versus the S&P 500’s 8.83%. From the chart below, you can see that the fund has been on a strong path upwards since the beginning of 2017, and its share price has climbed to the $19 range from $15. 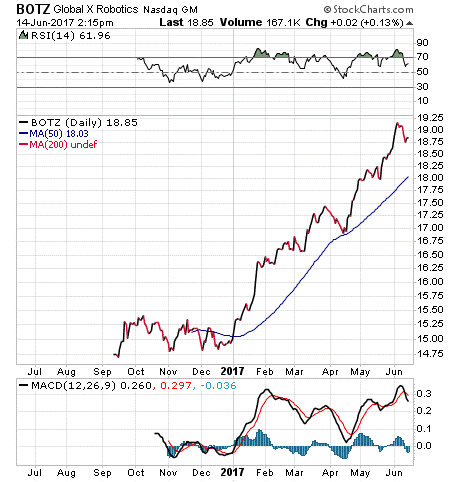 BOTZ has an expense ratio of 0.68% and does not pay a dividend. Currently, BOTZ is working with a relatively small and concentrated basket of companies. Its total holdings consist of just 28 companies right now. The fund’s top five holdings are Intuitive Surgical Inc. (ISRG), 7.92%; Keyence Corp, 7.64%; SMC Corp, 7.42%; ABB Ltd. (ABB), 7.26%; and Mitsubishi Electric Corp, 6.94%. If you believe in the future of robotics and artificial intelligence, I encourage you to look to Robotics & Artificial Intelligence ETF (BOTZ) to add to your portfolio.